With the Chilean battleship Almirante Cochrane deemed not far enough advanced to complete during the war, the 10 x 14" guns she was to be armed with were offered to Australis for use in a ship yet to be built. The Australis Navy accepted the offer and laid down a battlecruiser of the R type, in 1915, to be armed with a new triple turret that would arm the ship with 9 of the 14" guns, the last gun was incorporated in a shore battery near Darwin harbour. The Australis shared a similar hull layout as the Repulse class but had a wider beam to accommodate the triple turrets and a different bridge / funnel layout. 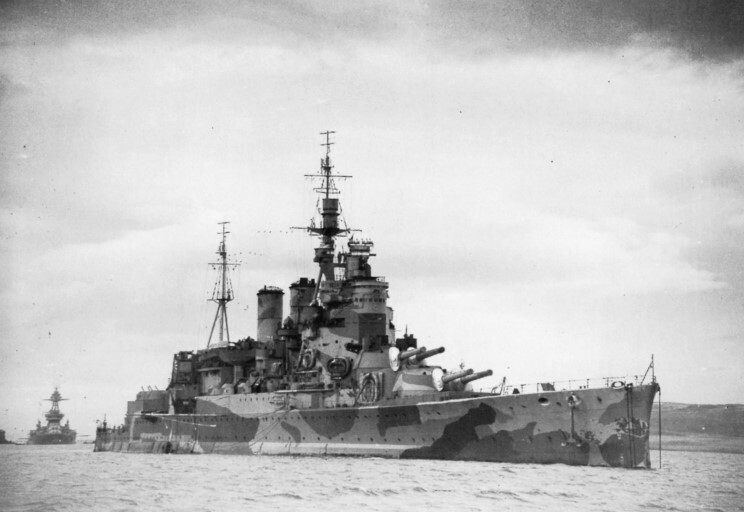 The previous Australis was renamed to release the name for this ship and as until the completion of Hood she was the biggest warship in the world. The Australis citizens certainly wanted their largest ship to advertise national pride. After various refits in 1927 and 1932 the ship was taken in hand in 1938 for a complete rebuilding on the same lines as the other WW1 capital ships. New superstructure, new secondary armament, new deck armour, new propulsion systems, new bow, and other improvements completely transformed the ship into a modern capital ship. The one thing that was not altered was the side armour which kept the 9" belt. This belt thickness was supposed to be able to withstand the German 11 & 12 inch guns and was certainly put to the test when the ship intercepted the Battle raider Seydlitz in the Indian Ocean in 1940. After a two hour stern chase the Australis came within range of her 14" guns and tried out her new radar ranging system which started producing hits almost immediately. Once she had been hit twice the Seydlitz turned to get within range of her own guns with the Australis trying to keep the range to her own advantage. A short sharp engagement took place where Australis was heavily hit by two salvoes but weight of arms held out and a 14" shell hit Seydlitz and penetrated her after shell handling rooms causing an explosion that blew the aft part of the Seydlitz off. A half hour later the Seydlitz sank by the stern her flags still flying with Australis and other arriving vessels picking over 400 German survivors out of the Indian Ocean. Many were lost to sharks before they could be rescued. Australis had to go back into dock to repair the battle damage incurred and was there through to the beginning of 1941. Further improvements had been added this time to her air-warning radar systems. The aircraft handling facilities were removed at this time, with more anti-aircraft weapons being added. The extra crew required to man the new equipment were housed in what had been the hangar that had been split up into extra accomodation and offices. Half sister Renown with CUS Quebec in the background.